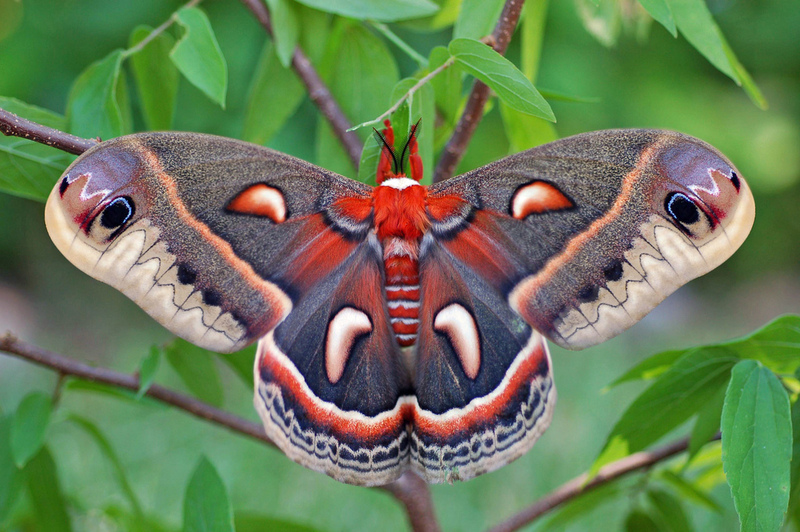 Moths have fascinated and delighted naturalists for centuries. Though not as fashionable as their day-flying cousins, the butterflies, many species of moth can be just as large and colorful. For many, this is reason enough to conserve them, but moths are also important. To corrupt the words of English poet John Donne, no organism is an island—everything exists as part of a wider ecosystem, interacting with the other creatures around it. The loss of any species can have unintended effects for the other species with which it interacts. In this way, moths play three key roles. First, their caterpillars are important herbivores, consuming a wide range of plants—including some crop species, but also many agricultural weeds. Next, moving up the food chain, moths provide an important source of food for animals. Many species of songbirds rely on springtime caterpillars to feed their hungry chicks. Moths also form a large part of the diet of bats, which are highly adapted to catch adult moths in flight. 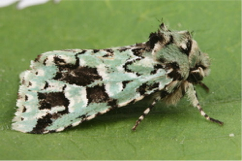 Finally, moths are thought to be important pollinators. Nighttime pollination has been less well studied than pollination by bees and butterflies, but researchers are beginning to understand that moths can also transport pollen of many flowers. Indeed, some plants, including certain orchids and cacti, are entirely reliant upon moths for reproduction. It has long been known that moths are attracted to bright sources of light—William Shakespeare referred to it in The Merchant of Venice! The proliferation of electric light in the past century or so has caused this to become a major concern; contact with hot components of lights can be fatal to moths. At its simplest, the attraction to lights (also called “flight-to-light”) can cause fundamental changes in moth behavior. In a research paper published earlier this year, we showed that around streetlights, fewer moths flew at the level of the vegetation (where they might feed at flowers or lay eggs) and more flew higher up, at the level of the light. However, recent research has shown that the problem runs much deeper. Some predators of moths, especially bats, prefer to hunt around artificial lights, exploiting the high density of their prey attracted in. Many species of moth are able to hear the echolocation calls of bats and respond by diving to safety on the ground. However, it has now been shown that moths fail to react to bat calls in the presence of artificial lights. One theory to explain this is that moths near artificial lights behave as if they are flying during the day, when encounters with bats are not likely to take place. Light pollution can also disrupt moth reproduction in several ways. Moths locate each other by the use of airborne chemicals called pheromones; these are emitted by females and used by males to locate potential mates. Studies have shown that light pollution can both disrupt production of these pheromones by female moths, and distract males from following them to the female. If mating does occur, light pollution can also impact upon the growth of caterpillars, causing them to reach a smaller maximum mass. The combined effects of these factors are thought to result in an overall reduction in the ability of moths to survive and reproduce. Moths are thought to be in decline in many parts of the world, with long-term data collected in the UK providing supporting evidence for such a reduction in abundance. The global increase in light pollution over the last century is likely to have contributed to these declines. By improving our understanding of the population trends of moths and the role played by artificial light at night in their declines, we may gain another compelling argument in our drive to improve standards in domestic and industry lighting, with positive consequences both for our night skies and for the creatures that dwell in the dark. By taking part in National Moth Week, you could help to generate important data that will reveal the status of moth populations. Most moth enthusiasts, or “moth-ers,” attract moths using bright lights; blacklights are great for this purpose as they are rich in the ultraviolet wavelengths that are particularly attractive to moths, but emit little or no light in the visible spectrum. But don’t worry if you want to observe moths without contributing to the light pollution problem! A simple way is to go out for a walk after dark; putting a red filter over a torch will allow you to watch moths without affecting their behavior. In particular, hedgerows can be a great place to search, and many moths can be found drinking nectar from flowers. Introduced species in the USA including English ivy (Hedera helix) and Butterfly-bush (Buddleja davidii) can be particularly popular. Alternatively, many moth species can still be attracted in without the use of light, using strongly scented solutions of sugar or alcohol (follow either of the recipes on this page). You can also help to reduce the impacts of light pollution on nocturnal wildlife, including moths, by taking action around your own home. If you have outdoor lighting, do you need to leave it on permanently? Timers and motion sensors can reduce the exposure of nocturnal wildlife to lights, and when the lights go out, any individuals that have been attracted can effectively be released. You can also choose to use warm lighting, containing less of the blue wavelengths that are most attractive to moths. The best steps for reducing light pollution for stargazing and for reducing impacts upon nighttime wildlife are almost the same; you can learn more about these here. Callum J. Macgregor holds a PhD in Biology from Newcastle University. He is currently a postdoc at the University of York, UK. His research looks at how moths and butterflies are affected by our changing environment and how they are able to respond.